Relish the memory. : Devour the Flower. With the heat of summer finally upon us, it has been a pleasure enjoying the sweet smells, warm rays and outdoor escapades. I have continued to embrace the abundant fresh produce, and recently endeavoured to transform a blossom into an appetiser in a matter of minutes. 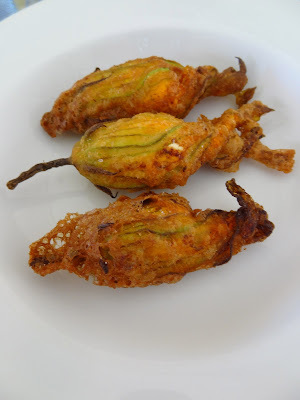 In keeping with the theme of the Zucchini my product of choice was the trendy –Zucchini Flower. Picked fresh from mothers vegetable garden. Despite the use of ‘Flowers’ by top Chefs around the globe. It would be fair to say that most of us are rather intimidated by these fragrant blooms. Collectively the challenge was laid out, and after seeing them feature on the menu at the famous ‘Riverstone Kitchen’ in Oamaru, I was determined to give them a whirl. And whirl they did. After much debate about the growth patterns of the zucchini plant, we picked three luscious orange florets and were ready to roll. A jackpot from a Google search brought up a recipe requiring a Ricotta-garlic stuffing. Ideal! As I bought two ‘reduced to clear’ pots just yesterday (another of my many ‘jewish’ moments). So the challenge was on. Fortunately this particular recipe had a profound set of step-by-step instructions and even images to follow. These were essential when dealing with the intricate and intertwined petals. Stuffed and ready to roll. The stuffing consisted of ricotta, garlic, grated parmesean, fresh basil and the best versions of your old mates S & P. The batter was an unsophisticated combination of flour and soda water. As my pot of grapeseed oil began to warm on the stove-top I battled with co-ordinating the unravelling, piping and coating of the delicate morsels. But with two extra sets of hands the load was shared and they were ready to frizzle in the scalding oil. Fry time: Max 3 mins. Possibly even 2. The vision of golden brown delights meant they were ready to leave their bath and drip-dry on the paper towel. Mission complete. Time to party. I made a small incision through the dainty petal, only to discover a world of white, fluffy cheesy goodness. Verdict: Divine! Outclassing any other deep fried artefact I have devoured in a long time. A collective conclusion decided the three small morsels were well worth the effort, and would be a delightful option for a fancy dinner party starter. But for now, I’ll just recall the temporary party that went on in my mouth!